This week it was my birthday, and to celebrate I made like the queen and had a double celebration; dinner with Dan on my actual birthday and then the main celebration on the weekend. It's only right when your birthday falls on a Wednesday right? Knowing the weather was going to deliver another scorcher on Saturday, me and the girls headed to Bourne and Hollingsworth for brunch. Although at 1:30 it's technically a late lunch, but their brunch menu is served until 4pm so we tucked straight in. 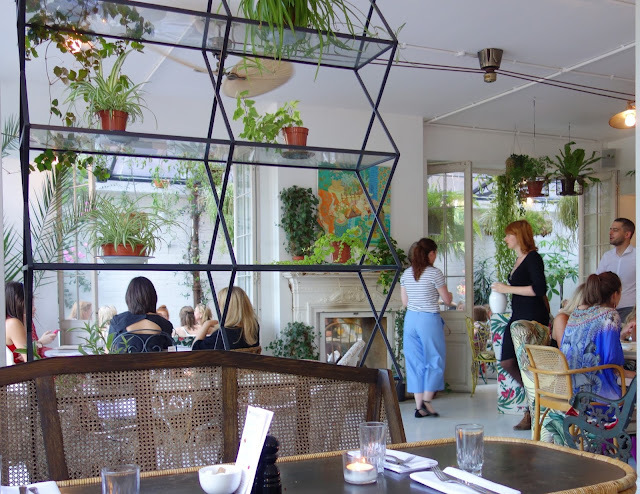 I'd read about this place on The Londoner's blog a while ago and it is such a good weekend brunch spot with the girls. We loved it. As we walked in all you could see was groups of girls all brunching together, alcohol flowing and such a positive vibe. We couldn't help ourselves at get outfit envy every time someone walked past too. Definitely recommend this as a great girls meeting place. Not that there weren't guys there...just not that many of them. Not surprising it was bottomless Bellinis' all round. Thankfully this place gives great portions and wasn't like many places you go where you end up with more juice than champers at the end of it. We were treated to a range of flavours too, pineapple, peach and white peach variations - each better than the last. After a few drinks, we turned our thoughts to food and various treats; English breakfasts, hash and I had the Dropped Scones with berries, clotted cream and maple syrup. It was delicious. If you read my post earlier in the year you'll know I've had a craving for pancakes ever since, but not willing to waste it on any old pancake, these were well worth the wait. The only thing I'd say is the cream was a little bit sweet, however it was an amazing brunch. After a couple of hours, and with the bottomless bellini's coming to a stop after 4pm, we went off in search of a rooftop bar to bask in the sun and meet up with some of the others. We walked off our brunch and headed to Golden Bee in Shoreditch. Because we were a group of girls we were allowed up, and headed straight to the top floor which was so nice. Chilled vibe, and of course all the tables were booked, but we found a spot to perch on and pretty much stayed there from then on in. We were met by some others later on in the evening and the rest is a blur of fun, photo's and too many shots. I have had such a great birthday, and just wanted to say thanks to everyone who helped make it so fun and special. Shame every week can't be like this!